More than 140 million children are at greater risk of illness, hearing loss, blindness and even death globally if urgent action is not taken to provide them with life-saving vitamin A supplements, the United Nations Children’s Fund (UNICEF) has warned. In a new report “Coverage at a Crossroads,” released on Monday, UNICEF stressed that just two doses of vitamin A per year, can save thousands of children’s lives. The World Health Organization (WHO) has classified vitamin A deficiency as “a public health problem” affecting about a third of all children aged 6 to 59 months - according to 2013 figures - with the highest rates registered in sub-Saharan Africa, at 48 per cent; and South Asia at 44 per cent. 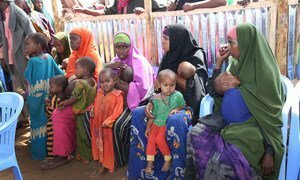 One million children aged six months to 10 years in Puntland and 4.2 million across Somalia were reached during a five-day measles campaign that wrapped up on Sunday, the United Nations has reported.